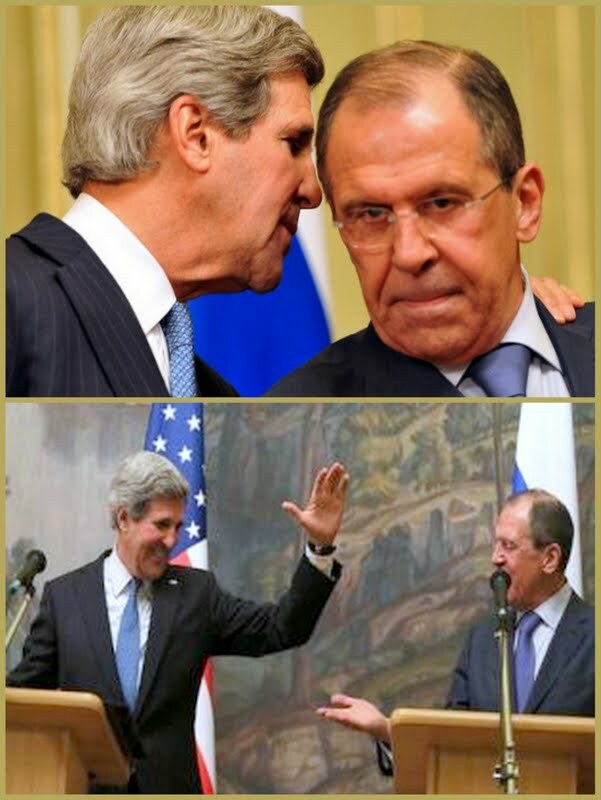 Kerry and Lavrov: Gimme five! U.S. President Barack Obama’s “red line” for Syria has transmuted into a “white flag,” according to Abdelbari Atwan, publisher/editor of the London-based pan-Arab daily al-Quds al-Arabi. And most political analysts in today’s Arab press seem to be of the same opinion. The reaction is to last Tuesday’s announcement in Moscow of a U.S.-Russian agreement to convene an international conference to find a political solution on Syria. U.S. Secretary of State John Kerry said they would encourage both Damascus and the opposition to negotiate. The deal came after Kerry's talks in Moscow with President Vladimir Putin and Foreign Minister Sergei Lavrov. Kerry and Lavrov announced they would try to organize the international conference before the end of May if possible. The forum will try to convince both the Syrian government and opposition to accept a solution based on the core elements of the final communiqué issued on 30 June 2012 after the UN-backed Action Group for Syria meeting in Geneva (see my post of the same date, “Syria Action Group leaves open Assad Question”). The Geneva communiqué called for the formation of a fully empowered transitional government. But there was no understanding on the future role of President Bashar al-Assad and his inner circle. The opposition and Washington were insisting he should stand down before any negotiations. Now Washington seems to have softened its position to the extent of leaving Assad's future up to the outcome of negotiations and whatever the Syrians themselves decide, which has long been Moscow’s position. Atwan, in his editorial comment for al-Quds al-Arabi, says: “Clearly, the U.S. administration made the bigger concession in Moscow by embracing the Russian position. The administration has suddenly clammed up on Assad having to step down before any negotiations, on evidence of his using chemical weapons against his people, and on his days being numbered. Atwan says, “There are two winners from the American-Russian political move. “The first is President Bashar al-Assad, albeit for the time being. “The second is Special Envoy Lakhdar Brahimi. “Assad has recouped his international legitimacy because he and his regime will now make a strong comeback to the international arena – with the kind of U.S. blessings he had long been hunting for. “Lakhdar Brahimi will shelve for six months his plans to resign and go into retirement and oblivion. He will bask again in all the glory of returning to the political and media spotlight, which he must be missing. “America does not want a war in Syria or Iran and wants to avoid them by all ways and means. The Russians share its apprehension. “The only war the two sides want to wage independently or in tandem is against Islamic Jihadist groups in Syria, Iraq and Afghanistan. “Thus, be prepared for American and Russian ‘revivals’ that are now in the making. The United States has for years listed Hezbollah as a terrorist organization. Saudi Arabia’s most eminent journalist, Abdurrahman al-Rashed, who heads Alarabiya TV news channel, makes no mention of the group in his column today for the leading Saudi daily Asharq Alawsat. “What we can tell Secretary Kelly is not to trust the Russian-Iranian offer, which manipulates American fears to dictate a political solution aimed at getting rid of Jihadist organizations. “In practice, the offer can only widen the conflict and empower the terrorist groups. The latter will surely exploit the wrath of the majority as it is coerced to go along with a solution it does not want, coming as it is at the price of 100,000 deaths, five million refugees and a country biting the dust. The Russians, Rashed adds, are capitalizing on the Americans’ alarm at getting Jihadists the day after Assad. Unlike regular warfare, he says, civil wars are fierce and emotive. Each side is familiar with the other, perceives the fight as existential and anticipates a loser and a winner rather than a compromise. “Countries where civil wars ended with a loser and a winner – America and Spain, for instance – had a better chance to rebuild and lay sound statehood foundations after a difficult transition, chiefly for the loser. The Syria war is unlikely to end with a negotiated political solution and the U.S.-Russian blueprint as it stands is no more than a pipe dream. Labels: al-Qaeda, Assad, Geneva communique, Geneva Declaration, Hezbollah, International conference, Iran, Islamic extremists, Israel, Jihadists, Kerry, Lakhdar Brahimi, Lavrov, Obama, Russia, Syria, Takfiris, U.S.